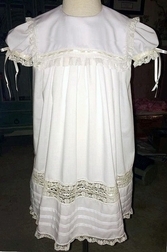 A lovely heirloom dress for flower girls, First Communion, baptisms, portraits and holidays. We start with heirloom batiste fabric in white or ecru or your choice of pastel colors and craft a beautiful float style dress. The dress is made with a large square collar embellished across the bottom and sides with Frence lace and just above the bottom of the collar with beading through which small satin ribbon is woven. The sleeves of course are finished with French lace and also have beading with satin ribbon that ties into bows. 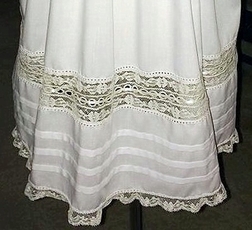 The skirt of the dress has several folded tucks with French lace and ribbon detail just above. The hem is trimmed in French lace. One of our favorites!